Published by Cyril Huze October 16th, 2011	in Accessories, Builders, Customs and Editorial. You may have bought the new Harley-Davidson Blackline model for its stripped down style, but still want the convenience of saddlebags for overnight trips. These new Detachable Leather Saddlebags (P/N 90200353, $799.95) can be removed from the motorcycle with a pull of an internal handle, leaving behind two inconspicuous docking points. Finished in rich black with contrasting light-grey stitching, these bags feature traditional leather straps and chrome buckles that conceal convenient quick-release closures. A textured-vinyl, pouch-style lid opens to reveal 800 cubic inches of space in each bag. A rigid backing plate helps the bag retain its shape. These bags are compatible with other detachable accessories when installed with the appropriate docking hardware kits. Installation requires separate purchase of Turn Signal Relocation Kit and appropriate Docking Hardware Kit. 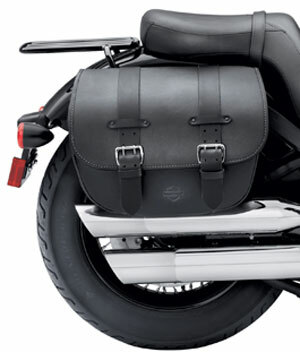 The Detachable Leather Saddlebags are one of several new Harley-Davidson Genuine Motor Accessory items designed specifically for the Blackline, including quick-release windshields, two-up and solo seats, detachable sissy bar uprights and passenger backrest pads, a luggage rack, and more. See an authorized Harley-Davidson dealer for details or go to Harley-Davidson Parts Website. Are the pipes burning the bag? Wow, I almost LITERALLY spit my coffee onto my keyboard when I read the price! I know Harley isn’t forcing anyone to buy these things at gun point but I have to wonder how they can sell somebody those bags at that price and still have a clean conscious! Maybe that just shows I don’t have what it takes to be a dealer =). I agree with Matt! The price is shameful, but then a fool and their money are soon to part. Gotta say though that it is a good profit margin for the company. By the way, are these bags made in America? If not, shame on HD. The Price includes the Fiberglass Bags also! They are just primed, waiting for your Paint !!!!!!!!!!!!!!!!!!! Big: I don’t see any mention of fiberglass bags anywhere. Price out Indian bags……..you’ll see what expensive really is. thier expesive because no other bag fits the blacklin e.